The On the Record newscast is Ag Equipment Intelligence's twice-per-month, exclusive farm equipment business news and analysis web broadcast. Technology Corner explores current events and trending precision ag industry stories. If you have an idea for a story you'd like to see, please email Jack Zemlicka at jzemlicka@lessitermedia.com. 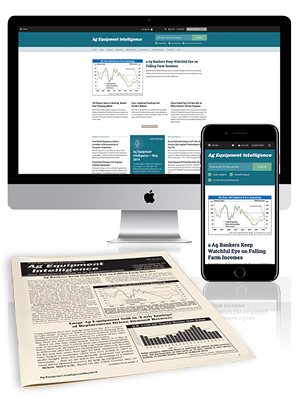 Access our archive of video coverage impacting the ag equipment industry. The Ag Equipment Intelligence webinar series brings industry experts speaking on a wide range of topics straight to your computer or mobile device. Best of all, it's free to register! If you can't attend the live webinar event, you can watch the replay at your own convenience. Our newly launched Ag Equipment Intelligence podcast series covers a broad range of topics within ag equipment market analysis and trends. Click to listen to the latest episode and subscribe on one of our network hosts. Our popular On the Record newscast is also available as a podcast. Click to listen to past episodes and subscribe on one of our network hosts. Looking for more content on a specific topic? View our list of topics to explore more content in your area of interest.